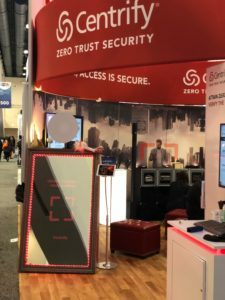 Centrify Software tasked our team with developing an engaging and innovative booth activation to attract IT professionals visiting the trade show floor at the annual RSA Conference in downtown San Francisco. The Centrify Marketing Team wanted the booth to “verify” users to hi-light a core features of their software application. SF Bay Photo and Mirror Booth set about creating an activation that was not only relevant for IT software professionals but was also visually engaging and demonstrated the power of digital technology. 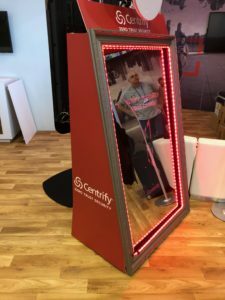 SF Bay Photo and Mirror Booth worked closely with the Centrify team to fully understand their objectives and ensure we created an activation that stood up to the scrutiny of tech-savvy IT professionals. 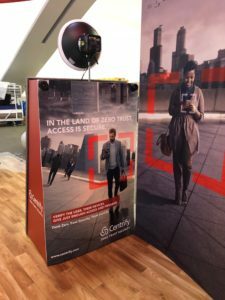 The team created a bespoke photo booth experience that would attract conference attendees to the trade show booth, allow them to engage with the Centrify sales staff, and instantly create branded digital content for sharing on social media. Designed a custom graphic overlay for the digital images created with messaging tied to the goals of the campaign. 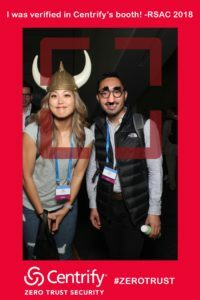 RSA conference attendees were delighted by the chance to “verify” themselves as part of a unique photo experience. The engaging brand activation also allowed for immediate sharing of branded images that could be uploaded to social media with hashtags as part of a contest to win prizes. Every fan was able to send themselves a fully branded digital image via email or text message to save as a ‘memento’ from the conference.